Just as Danish and Norwegian, Swedish also belongs to the North Germanic language group. It is not a widely spoken language: some 9 million people speak it in Sweden, although it is also used in some regions of Finland, where over 5% of the population use it. Swedish is recognized as an official language in Finland, too. Nordic countries constitute an entity in themselves, they are close geographically, ethnically and share similar sounding languages. Even a shallow exploration into Scandinavian history reveals that all Sweden, Denmark, Norway and Iceland share common roots. If you ask people what they associate Scandinavia with, the most likely answer surely is “the Vikings”. Thus, it seems reasonable to assume that any common features still present in Scandinavian languages today (apart from Finnish) can be traced back to Viking times. Indeed Old Norse, which was the North Germanic language spoken by the inhabitants of Scandinavia and their overseas settlements during the Viking Ages is the mother of all those four languages. Old Norse was spoken until around 1300 AD. Old Norse was an evolution of the very early Proto-Norse, which was spoken in the region during the 8th century, evolving into the different modern North Germanic languages after the Viking Ages. Along with other North Germanic languages, it derives from Old Norse and is currently the most widely spoken North Germanic language. It is composed of the Roman alphabet in addition to a handful of other letters. The standard word order in Swedish follows that of most Germanic languages, that is, the finite verb always appears in second position in a declarative main clause. Morphologically Swedish is similar to English, that is, words have practically lost inflections apart from some exceptions and there are no grammatical cases, and a distinction between plural and singular. Swedish has masculine and femenine gender, though. Again, just as it happens in English, adjectives are compared in the same way, but they are inflected depending on gender, number and definiteness. Older analyses posit the cases nominative and genitive and there are some remains of the use of accusative and dative forms as well. Unlike English, though, the definiteness of nouns is marked primarily through suffixes and not articles. This is then complemented with separate definite and indefinite articles. Swedish is also spoken in Norway, Brazil (where between 800,000 to 1 million people claim Scandinavian ancestry – the first sea line between the two countries was initiated in 1909), Argentina, Estonia and the USA. In fact, the US alone accounts for approximately 300,000 Scandinavian speakers. 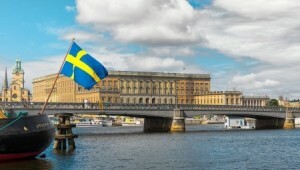 Out of the 9.5 million Swedish-speaking people, there are over 7.9 million who access the Internet worldwide in Swedish. The main feature of Swedish culture is its strive for “egalitarism”, possibly a trait inherited from Viking times. As a result of their strong preference towards egalitarianism, competition is not encouraged. In Sweden, children are educated to believe that they are not any more special than any other child – a characteristic shared by the Japanese education system. Also, Swedes do not take hospitality or kindness for granted (a typical British feature, too). Therefore, they will often say “thanks” when other nations do not. Failing to say “thank you” for something is perceived negatively by Swedes. General behaviour in Sweden is strongly balanced towards “lagom” or, ‘everything in moderation’. Excess or boasting are abhorred in Sweden. People strive towards the middle way. For example, a “work hard” philosophy or a “play hard” approach to sport are not popular, common concepts in Sweden. People work hard but not too hard. When they go out, they do so to enjoy themselves, but without taking part in anything extreme. Around the 8th century, the common Germanic language of Scandinavia known as Proto-Norse had experienced some changes and it had evolved into Old Norse. Through Viking invasions, Old Norse was a powerful influence on some English dialects and Lowland Scots. It also influenced the development of the French-Norman language, and through it and to a smaller extent, that of modern French. Other languages, despite not being closely related within the Germanic family, have been heavily influenced by Norse, particularly the Norman dialects, Scottish Gaelic and Waterford Irish. Non-related languages such as Russian, Belarusian, Lithuanian, Finnish or Estonian contain many Norse loanwords. Curiously, and according to some theories, the words Rus and Russia could come from the Rus people, one of the Norse tribe. The Rus were a group of Norsemen from the Varangian tribe, who had relocated somewhere from the Baltic region to Northeastern Europe and hence moved south, where they created the medieval state of Kiev. The current Finnish and Estonian words for Sweden are Ruotsi and Rootsi, respectively. Old Norse began to undergo changes after the 8th century that did not spread to all of Scandinavia. These changes resulted in the appearance of two close dialects: the Old West Norse (spoken in the outer countries: Norway and Iceland) and the Old East Norse (spoken in the inner countries: Denmark and Sweden). As politically independent bodies, the inner dialects of Denmark and Sweden began to diverge from 1200. Anyone looking at early medieval Swedish will see a very different language from modern Swedish. Medieval Swedish was based on a more complex case structure. At the time, Swedish had not experienced a reduction of its gender system and thus nouns, adjectives, pronouns and even certain numerals were inflected in four cases, pretty much like German nowadays (nominative, genitive, accusative and dative). Like modern German, Swedish had 3 genders: masculine, feminine and neuter. However, in time, the majority of the masculine and feminine nouns were merged into a common gender. Swedish verbal system was also more complex than it is nowadays. Similar to modern Romance languages, Swedish included subjunctive and imperative moods. Just like English at the time, verbs were conjugated according to person as well as number – a feature both languages have but almost lost. By the 16th century, we find a more recognizable language to modern eyes: case and gender systems in colloquial spoken Swedish and profane Swedish literature had been virtually reduced to the two cases and two genders present in modern Swedish. It can be considered that modern Swedish starts with the introduction of the printing press. After assuming power, King Gustav Vasa ordered a Swedish translation of the Bible, which took shape as “The New Testament”, published in the year 1526. A full translation into Swedish of the Bible followed in 1541. During the early decades of the 20th century, Swedish became standardized and Swedish is now spoken and written uniformly. A dialectal version of Swedish called Saami can still be found in some rural areas of Sweden, albeit the number of speakers is declining. Low German language had a very relevant role as a commercial language and was the lingua franca of the Hanseatic league. Thus, Low German had a strong influence in Swedish (and other languages in the region). For example, in mediaeval Stockholm, half of the population spoke Low German, which was also the language spoken in the 17th-century lands Sweden held in northern Germany (Swedish Pomerania, Bremen-Verden, Wismar and Wildeshausen). But Low German was also spoken in the rest of northern Germany and in Estonia and Swedish Livonia, were German traders operating for the league lived. The relationship between both languages was very intimate and some modern Swedish words can be easily recognized by German speakers, although they may seem “old fashioned”. During the 18th century and much of the 19th century, French was the language of culture and second language of Europe’s (and USA’s) upper classes and Swedish aristocracy often spoke French among themselves. Language-switching between French and Swedish was common. At its height in 1658 the Kingdom of Sweden comprised the present-day countries of Finland and Estonia, as well as parts of Latvia, Russia, Germany, Norway and Denmark. Estonian was the language of the majority in Swedish Estonia but the province, like Finland across the Baltic Sea, hosted both a Swedish-speaking minority and a significant German minority. Finnish was the majority language of Sweden’s East, although it had no written form and it was used almost exclusively as a spoken language. Finnish became a minority language in Sweden, too, because many Finnish speakers migrated for economic reasons. Like most modern nations, Sweden became industrialised during the 19th century. Population doubled in size, with the typical pattern of immigration from the countryside to towns and cities. This, together with generalised education and mass media, forced traditional dialects to give way for the standard language (Standard Swedish). The United States became a favorite destination for Swedish emigration and through it, Swedes came in contact with a not-so-distant cousing, the English language. Since then, English has grown as an important foreign language in Sweden, taught in primary schools and kindergartens from the age of 5 to 7 according to EU data. Sweden has one of the highest levels of second-language English speakers in the world. Swedish is an official language of the European Union.